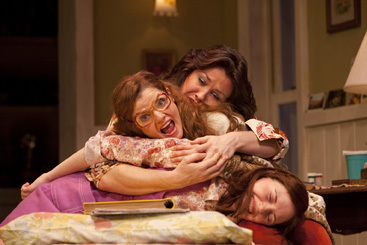 SIBLING RIVALRY, SOUTHERN STYLE: Mary Bacon (left), Georgia Cohen (center) and Molly Camp grapple with family secrets, and each other, in McCarter Theatres production of Crimes of the Heart, the Pulitzer-Prize-winning comedy by Beth Henley on stage through March 27. Beth Henley’s Pulitzer Prize-winning Crimes of the Heart (1981) — a Southern Gothic comedy about three Mississippi sisters, their wildly dysfunctional family, and their outrageous romantic lives — goes even a few steps beyond Mr. Conroy’s description. In a night of lush and Romantic choral music, Princeton Pro Musica presented their late winter concert this past weekend in the Princeton University Chapel. The performance Saturday night by the more than 100-voice chorus featured two diverse settings of the Requiem text by composers whose music was infused by their homelands and the tumultuous decades in which they lived.